Americans are more concerned about the environment than ever before. In a Gallup poll released earlier this year 64% of respondents said that they worry about global warming a “fair amount” or a “great deal.” Nearly 60% said that the effects of global warming have already begun, while another 31% believe that it will eventually. Read the 2017 edition of this annual study. Those responses communicate a key element of climate change and environmental degradation in general: it takes time to develop and can burden people who did not cause it in the first place. For that reason, the health of the environment is of particular importance to many parents, who want want their children to enjoy clean water, clean air and a stable climate throughout their lives. 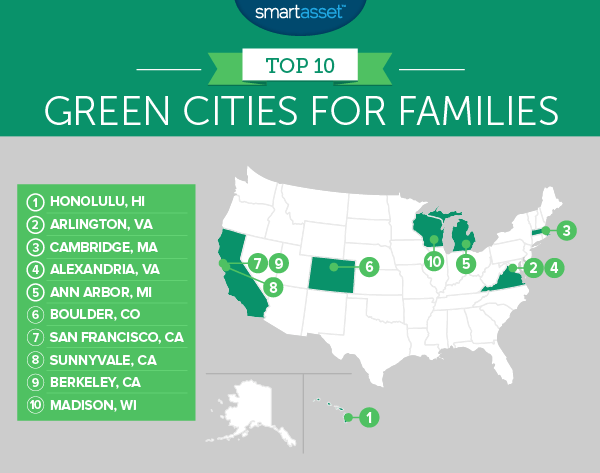 To find the best green cities for families, SmartAsset analyzed data on 327 of the largest cities in the U.S. from sources such as the Environmental Protection Agency, the U.S. Department of Agriculture and the Census Bureau. For each city, we considered eleven metrics in total. Six of these were reflective of a city’s level of environmental friendliness, including the average household carbon emissions, the percentage of commuters who do not drive to work alone and the number of farmers markets. Relocating to New York City? Here are 17 things to know about making the move. Bay Area a green haven. Three Bay Area cities rank among the top 10 best green cities for families, led by San Francisco. College towns rate well. More than half of the top ten cities in our analysis are college towns. Places like Boulder, Ann Arbor and Berkeley have long been at the forefront of the environmental movement. Boulder, for example, is working toward becoming a “zero-waste” community, while Ann Arbor has had a recycling program since the 70s. Looking for clean air? Honolulu is the place to be. The Hawaiian capital city’s EPA air quality index of 27 rates as third best out of the more than 320 cities in SmartAsset’s study. That’s not the only reason Honolulu is the best green city for families, however. The city also ranks among the top 50 for the average household carbon footprint, which is 41.25 tons of carbon dioxide per year. Working parents will also appreciate the city’s low unemployment rate, which is just 2.7%. 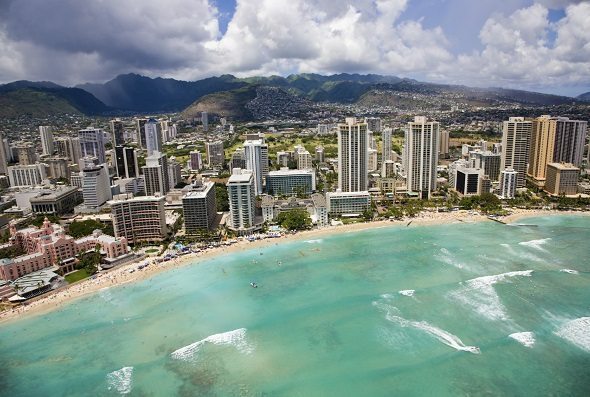 Find out now: What is the cost of living in Hawaii? Nearly 42% of all workers in Arlington use some form of clean transportation to get to work, the 13th-highest clean-commuter percentage of any city in SmartAsset’s study. About 27% commute by public transit, many of them using the D.C. metro system. In most cities, about 80% of workers commute by driving alone, which consumes more energy and has a greater impact on the environment. Arlington also boasts a very high quality of life. The unemployment rate of 2.4% ranks as the third-lowest of any city in SmartAsset’s analysis, while the violent crime rate is 24th-lowest. The average annual household carbon footprint in Cambridge is just 37.33 metric tons per person. That ranks as the ninth-lowest of any city in SmartAsset’s study. Why is it so low? For starters, Cambridge is one of the densest cities in America, with more than 17,000 residents per square mile. Secondly, very few commuters in Cambridge drive alone to work. In fact, 68% of commuters in the city walk, bike, use transit or carpool. Of the 327 cities in our study, that ranks second (New York City is first). The city of Alexandria is a participant in the EPA’s Green Power Partnership program, which works with local governments that receive some percentage of their energy from renewable sources such as solar and wind. Alexandria receives 19% of its power from such sources, which rates as the 26th highest among the cities in SmartAsset’s analysis. Ann Arbor’s green reputation is well-deserved. The city has had a recycling program since the 70s, making it one of the first major cities in the U.S. to introduce such a program. Nearly 38% of workers in the city commute in an environmentally-friendly manner, the 20th-highest ratio of clean commuters in SmartAsset’s study. Families will also find that, outside of its environmental virtues, Ann Arbor is a great place to live. The unemployment rate is just 2.6% and the average graduation rate at local high schools is more than 86%. The city of Boulder has set the admirable goal of becoming a zero waste community. Technically this means diverting and reusing 85% of all waste (the international standard for defining a zero waste city). Though currently about 34% of waste in Boulder is diverted, the city aims to reach that 85% level by 2025. That isn’t the only thing that makes Boulder a top green city and a great place to live. It also rates well for the percentage of commuters who use some form of environmentally-friendly transportation to get to work. At 40%, it ranks 17th in our analysis for that measure. The population density of a city significantly effects the environmental footprint of the populace. Dense cities consume fewer resources (on a per capita basis) and can rely on environmentally-friendly modes of transportation like busses and bikes. San Francisco has a population density of more than 18,000 people per square mile, second in the country only to New York City (among major cities). The city also has 23 different farmers markets, according to data from the U.S. Department of Agriculture. That is the sixth-highest number of farmers markets of any city in our study. Located north of San Jose in Silicon Valley, Sunnyvale combines a strong economy with good schools and low crime. It rates as one of the safest cities in America. While it is a relatively small city, it has a population density of more than 6,800. That ranks 50th of the more than 320 cities in SmartAsset’s study. Home to the flagship campus of the University of California, Berkeley has long been a center of environmental research and progress. For example, researchers at the university’s CoolClimate Network have mapped out the carbon footprint of every household in America. On that measure, the city of Berkeley rates quite well. The average household carbon emissions per year in Berkeley is 38.7 metric tons per year. That is 20th lowest of the 320 cities in SmartAsset’s study. One driving factor for that small carbon footprint may be the manner in which Berkeleyites get to work. Nearly 60% do not drive alone, the fifth-highest percentage of clean commuters in our study. According to the U.S. Department of Agriculture, the Wisconsin capital is home to 12 different farmers markets. That’s the 19th-highest total of any city in SmartAsset’s study. Those markets give Madisonians a way to buy local produce and other products (like cheese!) directly from the people who grow it. Madison also rates as a great city for families in a number of other respects, including its low unemployment rate, which at 2.9% is 18th-lowest in SmartAsset’s analysis. EPA air quality index annual average. An index reflecting the amount of particulate matter, ozone and other pollutants in the air over the course of the year. Clean commuters. The percentage of workers who do not drive to work alone and instead either walk, bike, use transit or carpool. Local government renewable energy usage. The percentage of energy the local city or county government gets from renewable sources. In addition to those six metrics, we considered five that gauge the overall quality of life for families in each city. Unemployment rate. This is the December 2015 county unemployment rate for the county in which each city is located. Average high school graduation rate of local schools. 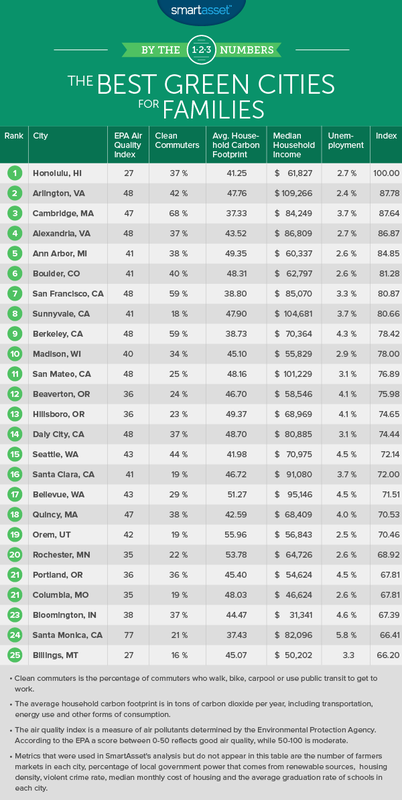 We ranked each city in our analysis according to those 11 metrics. We then averaged those rankings, giving equal weight to each metric. Index scores and the final rankings were determined by those averages. The city with the best overall average is ranked first and scored a perfect 100, with cities with lower average rankings got lower scores. Data on the median household income, median annual housing costs, housing density and the percentage of clean commuters comes from the U.S. Census Bureau. Data on the unemployment rate comes from the Bureau of Labor Statistics. Data on the violent crime rate comes from the FBI Uniform Crime Reporting system and local government websites. Data on average high school graduation rates comes from the U.S. Department of Education’s EdFacts website. Data on local government renewable energy usage was provided by the EPA’s Green Power Partnership. Data on the number of farmers markets comes from the U.S. Department of Agriculture. Data on the average household carbon footprint comes from the UC Berkeley CoolClimate Network, Average Annual Household Carbon Footprint (2013), available at coolclimate.berkeley.edu/maps.